The great Tibetan philosopher, scholar and reformer Je Tsong-kha-pa (1357–1419) is, by Tibetans and Theosophist alike, generally regarded as the reformer of Tibetan Buddhism of that age as well as the reformer of esoteric Buddhism. He is also the one who, though he himself has never been outside Tibet, is said to have taken the compassionate initiative to send a ‘messenger’ to the western world in the last quarter of each (European) century to make an effort to introduce them into the eternal values of inner Buddhism or Esotericism. The foundation of the Theosophical Society then is one of such efforts. Tsong-kha-pa studied the Buddha’s teachings of all Tibetan Buddhist schools of his time – all of which were less or more in decline, and received initiations and transmissions in all the major schools. His main source of inspiration however became the Kadampa tradition, which goes back on Atiśa. Based on Tsongkhapa’s teaching, the two distinguishing characteristics of the Gelug tradition1 are the union of Sūtra2 and Tantra,3 and the emphasis on the step by step graduated way to enlightenment along the three principal aspects of the path: 1) a genuine wish for liberation from illusionary and cyclic existence, 2) generation of bodhicitta and 3) insight into emptiness (Śunyatā). 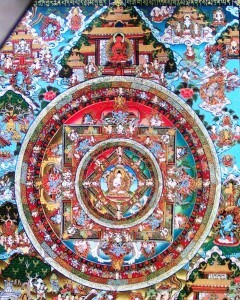 Atisha’s Lam rim inspired Tsongkhapa’s Lam Rim Chen Mo4 which became a main text among his followers. He also practiced and extensively taught the Vajrayāna or Diamond Vehicle, and especially how to bring the Sūtra and Tantra teachings together. For that purpose he wrote works that summarized the root teachings of the Buddhist philosophical schools, as well as commentaries on, among other works, the Prajnāpāramitā literature and Chandrakirti’s Mādhyamakāvatara. Tsong-kha-pa is thus known to have thoroughly studied and practiced the teaching of the extant Buddhist schools of his time, notably the Sakya-pa, Kagyu-pa and Kadam-pa and Nyingma-pa traditions. Furthermore, he promoted the study of logic, encouraged formal debates as part of Dharma studies – which today is still a daily practice among school students at monastery schools and scholars – and instructed disciples in the Guhyasamāja, Kālachakra5)and Hevajra Tantras. Tsong-kha-pa considered the Esoteric Community to be the most important of the tantras and used the Ārya tradition as a template for interpreting all the other tantric traditions.6. The Guhyasamāja7 maṇḍala consists of thirty-two deities in all. (from Wikipedia: Tsongkhapa.) These are the five dhyāni-buddhas of the seven rounds of evolution over the Earth in Theosophy. Two dhyāni-buddhas are still to become active in this function in the future, because so far we are only witin the fifth root-race of the fourth Round and the future two are not directly mentioned in published Buddhist literature. They are the same five (+ two) who stand at the four directions and the center of the maṇḍala of the Bardo Thodol (known as Tibetan Book of the Dead, by Padmasambhava (8th Century). In his two main treatises (lam rim chen mo or Stages of the Path to Enlightenment and sngags rim chen mo or The Great Exposition of Secret Mantra) Tsong-kha-pa describes in meticulous detail how one should step by step and according to one’s intelligence follow the Sūtra path and the Tantra path. 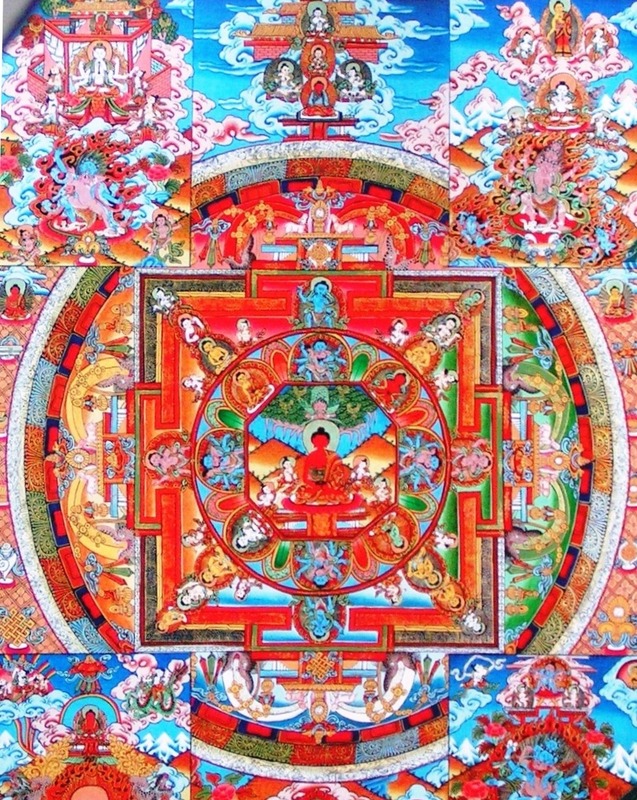 Therefore, it is very clear that when Tsong-kha-pa refers to Vajrayana, tantra and mantra, he does not refer to the base practices of some Indian or Tibetan tāntrikas, but it was his merit to separate the chaff from the grain and thus remove such aberrations from true Buddhism and purify the latter while including existing values and methods and bring Buddhism back to its original state. Tsong-kha-pa even destroyed dangerous tantric works that were available in his time. In the Land of the Snows. 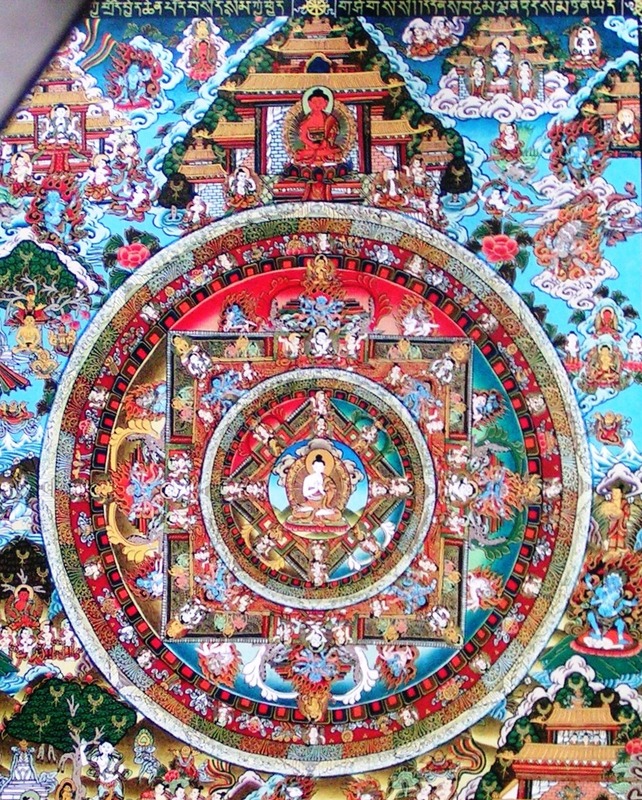 When modern scholars and followers talk about esoteric Buddhism they usually refer to mantra, tantra and Vajrayana. Vajrayanists present a path within Mahāyana of which they claim that it leads to nirvāṇa in a very much shorter time than the mere Pāramitā or Perfection Path of Mahāyana, perhaps even in one life time. Modern Theosophists are of opinion that ‘there is no short way’8; in other words, those who do such promises delude the public9. However it is too easy to reject the tantra (or mantra or vajra) path on basis of this claim only. This claim is partly imaginary, because every human being has to learn everything that is to be learned within all levels within our universe to become a self-conscious god or dhyāni-chohan. But one can, by moving away from lower mental action to higher and ever more subtle mental activity speed up the process. Is it necessary to choose the vajra path? Jesus stated for a very good reason, as quoted in Matthew 6:33, “But seek ye first the kingdom of God, and his righteousness; and all these things shall be added unto you,” ‘these things’ being the higher spiritual faculties and powers.Theosophy supports this point of view. Theosophy supports the Path of Perfection of pure ethics as it is propagated in Mahayana Buddhism, and supports the Path of Compassion beyond the arhat stage of Hinayana Buddhism (It means that Theosophy cherishes the idea of giving up one’s own benefit, including the fruit of highest enlightenment itself for any selfish purpose; thus a true Theosophist in the highest sense practices indefinite Patience, having lost the ability to choose for his own personal ego, because he unserstands that the personal, isolated ego which can profit without affecting the whole universe is but an illusion created by the mind, but has no true existence by itself. One of the great practices of the Perfection Path is Patience that is sweet and be disturbed by nothing10 one develops the great compassion or bodhichitta: the true and irreversible desire to relieve all beings from suffering and illusion, to elevate all souls still chained to matter, and to avoid no difficulty for oneself in doing so if needed for this aim, even if the positive result is but meager or imperceptible. This reflects the spirit of the Buddha himself. This is how one becomes a Buddha of Compassion. It is the Great Vehicle or Mahāyana to Buddhahood. Then why need a still ‘higher path’ called Vajrayana or Diamond Vehicle? Some say that by following this path one can start to perform wise and compassionate action sooner, and thus help more living beings quickly. But what is the meaning of ‘soon’ and ‘quick’ in eternity? There will never be a time in eternity when greatness of soul and compassion are not needed to help in some place on some planet is some situation somewhere. Compassion is the Law of laws. Moreover it is easy to tell oneself that one is ready for the higher and quicker path, whereas deep, below or beyond one’s daily consciousness there is still a selfish motivation. This will then inevitably lead to the disciples ‘fall,’ because the existence of even the slightest selfishness is based in a belief that a Self or independent ego truly exists. This is contradictory to the core teaching of Buddhism and Theosophy known as ‘Emptiness’ or ‘Zeroness.’ In realizing emptiness (śunyatā) any illusion of egoness or true existence of phenomena on themselves disappears for ever. No thing that we call ‘true’ in our world is really true from the viewpoint of a Buddha. The true Vajrayāna path can therefore only be entered when emptiness has been realized and unselfishness alone remains within the disciple or chela. Then only can one enter the Path without risk. It is for those whose task or dharma lies there. The instructions on this Path are secret, even though apparently made public in modern books. They cannot be written down or transferred by words, and only a true Master or Mahātma or Bodhisattva can recognize the soul of such a pupil. Even then arduous tests are necessary ‘to test the purity of the gold in the fire.’ Every possible contamination must evaporate. Only when the disciple is truly ready the Path can be trodden. This Path may be quite different from what is now known to the world as Vajrayana. If Tsong-kha-pa was the true esotericist eulogized by Blavatsky, true esoteric Buddhism must be more than the methods described in Vajrayana. Perhaps it should be called ‘exoteric esotericisms’ The true esotericism is has hidden as ever. Paramitayana describes the spirit of the Buddha, Vajrayana makes use of visualizations of bodies of deities – all aspects of Buddha. 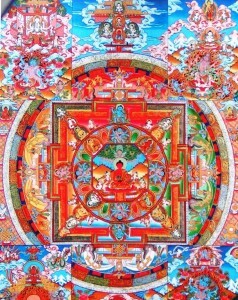 Also Vajrayana in its external teachings emphasizes on the steering of energies (prāṇas of the subtle (astral) body, which are but the lower two aspects of the human constitution, and therefore can lead to a certain subtilization the human bodies, which may lead to helpful siddhis or powers to be applied in the context of compassion. It can also rid the mind of its normal distractions and tendencies, thus leading it to ever greater power to distinguish even within very subtle thought-events, greater sharpness even within very subtle thought. Still then, there must be a higher path in which these subtle aspects of the mind are applied to penetrate still deeper, into the truly esoteric – and that is actually where the ‘Life’11 is entered – until it has become merged with buddhi, infallible non-dualistic Wisdom. Then, no more powers of a lower order are needed, or they can be created whenever they might be useful for some purpose of the bodhisattva. It is known from the short history of the modern Theosophical Society that many aspired to and applied for chelaship at the feet of the Masters, but almost nobody proved as yet to have the stamina and purity of heart to enter the gate. It is also known that the few who did pass the preliminary tests before their own higher being and were ‘taken in,’ developed higher psychic and spiritual powers quickly and thus left every would-be fakir, yogi or psychic in the shadow. Such chelas (disciples) are helped to gain insights into the invisible and inner worlds of themselves and the Universe, and thus tremendously speed up their evolution and ability to practice Compassion effectively. This path is really still for the very, very few in this period, but at the same time is as ‘old’ as eternity itself. This wisdom is were so many mythologies throughout history the world over refer to in hidden terms within their stories. It is also the reason why the modern Theosophical movement gave out teachings about things that for the worldly eye seem complete nonsense, impractical for daily life and at best attract curiosity – which if not satisfied quickly leads to disappointment. These teachings however are preparatory stages of inner teachings to be given to individuals and humanity in times to come. Tsong-kha-pa himself has written about ‘How to train specifically in the Vajrayāna’ at the end of his work Lam Rin Chen Mo available as the three volume English translation called The Great Treatise on the Stages of the Path to Enlightenment by J.W.C. Cutler (Editor-in-Chief). His Summary and Conclusion (Chapter 27 of this work) is posted on this website as Lam Rin Chen Mo Chapter 27.